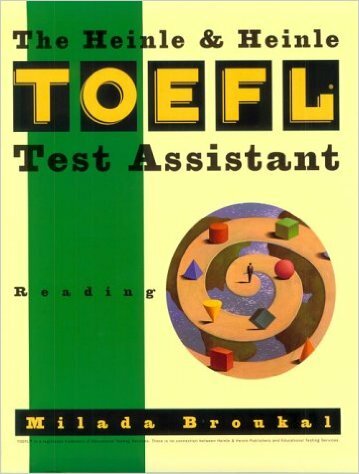 Heinle & Heinle TOEFL Test Assistant: Reading is designed for both self-study and classroom use to prepare students for the reading Comprehension of the TOEFL Test. Each chapter covers a type of reading question that can be found on the TOEFL. The first part of each chapter introduces the question through a reading passage. This passage is easier than the passages on the TOEFL. Its purpose is to introduce students to the type of question they will study in the chapter. The second part of each chapter tells in detail about the type of question, giving examples and suggesting strategies. The exercises in the third part will give students plenty of practice in reading on a variety of topics and in answering questions similar to those found on the test. PART ONE: TYPES OF READING COMPREHENSION QUESTIONS. 2. Reading for Reference and Vocabulary. 3. Reading for Main Ideas. PART TWO: READING COMPREHENSION PRACTICE TESTS.